Hermann Lang started racing motorbikes as a teenager and at the age of 22 he won German sidecar mountain race championship. His life was changed when he got a job at the Mercedes factory and was soon drafted onto the grand prix team as head mechanic for Luigi Fagioli, eventually being given the chance to try out as a driver. He made an immediate impression and in 1937 won the Tripoli Grand Prix, a feat he repeated in the next two years. In 1938 he won two more races but it was not until 1939 when he dominated the season with five wins in eight races that he was finally accepted by his peers who looked down on the working-class interloper. He was so out of his social depth that after his first victory he locked himself and his wife in their hotel room as they had nothing to wear at the post-race dinner. The season was cut short by the war ( "My world disappeared" he lamented). and the German authorities controversially awarded him the European Championship even though Hermann Paul Müller was the points leader. 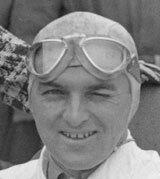 He returned to racing in 1946 but the all-conquering Mercedes team had gone - despite that, he won his first race driving a six-year-old BMW. In 1949 he started sports car racing and moved into Formula Two before joining the re-formed Mercedes team at the 1951 Buenos Aires Grand Prix. The following year he won the Le Mans 24-Hours with Fritz Riess, and in 1953 he drove twice for Mercedes, finishing fifth at the Swiss Grand Prix, and he retained his place in 1954 but increasingly found himself replaced by much younger drivers. When he span out of the German Grand Prix after ten laps and then lost a race-off with a rival too see who should take the team's No. 3 seat, he acknowledged that at 45 his time had gone and he retired, returning to work at the Mercedes factory. He published an entertaining autobiography titled Grand Prix Driver.